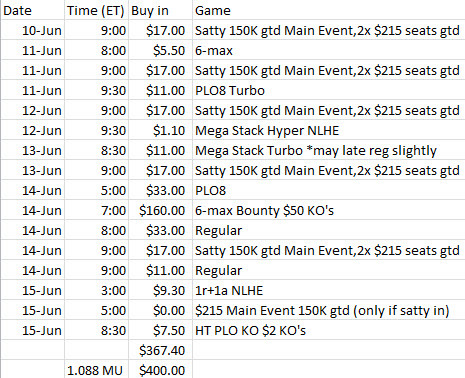 This one is a bit higher variance in that I've included 1 bigger buy in (although it's a KO event so that may help) and 5 satellites to the 150K gtd main. Obviously with more variance comes more home run potential, but there is no guarantee of winning any money in the pokers! If I win an early satty to the $215 main event, I may play or skip future sats at my discretion... of course if I skip any tournament for whatever reason, the buy in+MU will be refunded like last time. I will account for half %'s, with a max per person of 3% for now, so .5%-3%. Since 30% sold out pretty quickly last time, I'm going to open 40% this time, and keep 60% of my own action. I will play regardless of how much sells though. Dale and Cat have been kind enough to help facilitate via paypal again for those that can't do one of the first 2 options... please do make that a last resort however. Thanks Dale and Cat! I'm going to temporarily hold back 10% for off-tank investors, since I had a couple last time and want to give them a fair chance to know about this. I'll release what's left of this in a couple days after those peeps have had a chance. But ya forgot the wodka tax ??? and best of luck . Put me in for 3%. I'll have my wife send $12 over via paypal when she gets home. Thanks all, I'm updating the OP now. Trap if you can help with some xfers on ACR that's great too. And Dale you guys can just do 1 big transfer once this is closed and you've gotten all the money. Thanks guys for helping out. I'll go for 1%, will transfer from ACR. Thanks, and confirmed! OP updated. Former non-tank investors have had their shot... the hold on the extra shares is off. Some people have requested additional shares if this doesn't sell out at the 3% cap, I've added this wait list to the OP now. I'd like to give this at least a few more days for those who may not have been around this weekend and such to get a chance, but will be happy to raise the cap over the 3% per person should it not sell out. Of course anyone who has reserved less than 3% may add more immediately, if they wish, up to the 3% total. Also, if you are paying via the Dale/Cat wodka exchange, you'll be marked as paid in the OP once I actually get the money... to make things easy they will make one lump sum transfer to me once all sales are closed and they have everyone's funds. As long as you've confirmed transfer to Dale on Stars you're good to go.